The agitator design and mixer selection is closely integrated with the stirring purposes. Various agitating processes need to be operated by different stirring devices. When designing and selecting the mixing machines, firstly we should determine the model of the mixing impeller, motor power and stirring speed according to the agitating purposes and requirements. Then the speed reducer, frame, stirring shaft and shaft seal are selected. 1. Selecting the agitator type according to the process conditions, stirring purposes and requirements, we should fully know the causal relationships among the dynamic property of impeller, the current status in the mixing process and the different agitating goals. 2. Confirming the motor power, stirring speed and agitator diameter in accordance with determined impeller type, the flow state and the requirements of stirring time, settling velocity and dispersion degree control through experimental means and computer simulation design. 3. To choose the reducer on the basis of motor power, stirring speed and process conditions. If the reducer is selected according to the actual working torque, the actual operating torque should be less than allowable torque of the reducer. 4. To select the same specifications of rack and coupling in accordance with the output shaft head d and shafting support pattern of the reducer. 5. Installing the containing space and working pressure in accordance with the size of the spindle nose. The operating temperature chooses shaft seal type. 6. 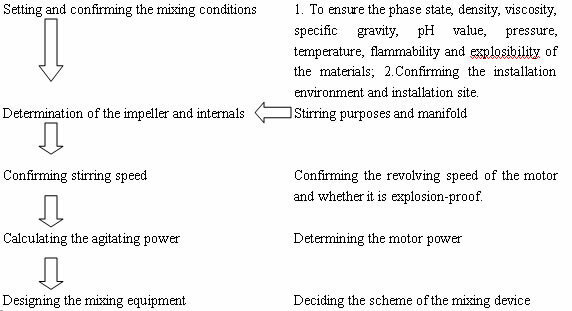 Designing and choosing the structure pattern of the mixing shaft on the basis of installation form and structure requirements. Additionally the strength and rigidity shall be checked. 7. To set up the bottom cover or flange according to the nominal diameter of the crack and pressure grade. 8. Whether the auxiliary bearings need to be configurable or not rely on the supporting and shock resistance conditions. The shape and dimension of the stirring container is determined according to the scale production, mixing purpose and material properties. If there is no special need, it generally choose vertical drum container and determine the appropriate ratio of height to diameter. If the heat transfer required, the outside of the kettle shall be set up jacket structure. The reducer can satisfy the requirements of power and revolving speed. This reducer features in reliable operation, easy maintenance, high mechanical efficiency and low noise. Stirring shaft needs sufficient bearing space in order to ensure that the deflection amount of agitating shaft is not big. The rack should guarantee the output axis, mixing shaft, shaft seal device are centering, and has enough radial and axial bearing capability. 1. If the liquids leak more and the pressure of the kettle is lower, the packing seal can be selected. 2. The mechanical seal can be used under the following situation: little leakage, high pressure or vacuum degree and low friction power consumption. 3. When the mixing medium is toxic, flammable and explosive, the magnetic transmission may be the best choice. If the materials are expensive and high purity, or operation in a high vacuum state, it also can use and choose the magnetic transmission. The stirring shaft should have enough torsinal strength and bending strength. Usually the agitating axis may have sufficient rigidity, and the rotational speed should be avoided at 800 ~ 1200r/min. If the revolving speeds within this range, the mixing shaft may be considered to have certain flexibility. The mixer impeller can ensure effective mixing of the material with less power consumption and lower cost. It is easy to operate and maintain. According to the impeller model and the operating characteristics of materials to determine if the baffles and inside cold tubes are needed. If the baffles are required, the low viscosity liquid usually is operated under the conditions of full baffles, which has four flappers and the width is 1/12 to 1/10 of the stirring vessel diameter. The baffle width can be narrowed with the viscosity increasing. The high viscosity fluids do not need to set up flappers. 1. To confirm the required process. 2. When selecting the type, it is better to refer to the pilot test data of the laboratory equipment. 4. To determine the desired productivity and yield. The choice of mixing machine meets the requirements of rate of production and output. 5. To confirm the special demands for the device structure and the surface treatment according to production hygiene requirements. 6. Please take a conservative mixer selection method under the circumstances of unforeseen factors and complex process. 7. The equipment installation, occupied space, hydroelectric configuration and installed capacity should be unified with the plant layout. 8. Please estimate the equipment purchase cost, installation charge, operating cost, maintenance expense and depreciation charge. Please try to select and use the advanced production process equipment, especially the enterprises which have high requirement on fineness. With the development of science and technology, especially the rise of nanometer materials, many industries claim the particle size as small as possible after stirring. Some diameter of particles even requires reaching less than 1μm, and this can not be achieved by traditional mixing machine. The emergence of a new device is to meet the increasing market requirements. As a new technology appears, the production efficiency and product quality will be improved, but the manufacturing costs will be reduced. Choosing a new facility means that your enterprise will have a higher base in the market competition. For a variety of flow process, LINKER offers different forms of mixing machines to match and carry out optimal combination in order to make the system achieved the best state. The elements of optimal combination integrate technology, output, investment scale, plant and other factors. We will work out the most reasonable device configuration, technological process and equipment layout scheme according to your needs. Please feel free to send us your resume to sales@linkerindustry.com for our record.